stopped for gas and noticed that his undercarriage was meowing. 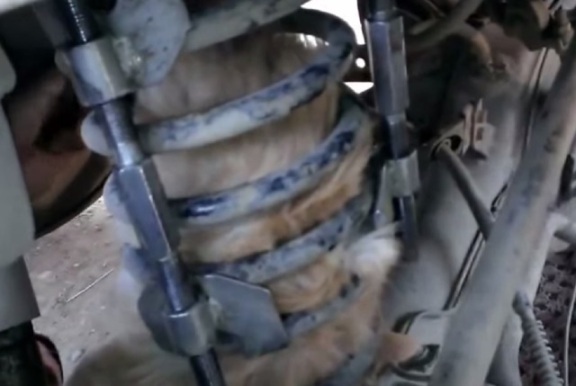 When he first checked under his car he could see nothing, but the meowing continued. 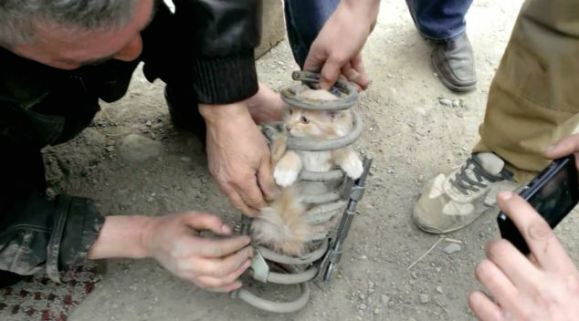 Finally he noticed that a kitten had somehow managed to get stuck in a spring in the vehicle's suspension. While it was mighty curious as to how the cat got in there (or how long it had been there), the bigger problem was how to it out. The job took the station attendant, police, and tire service guys to accomplish. They realized that they would have to dismantle part of the car get the cat out of its predicament. 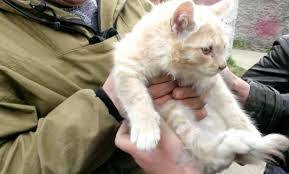 The entire operation took three hours, but the cat was removed considerably ruffled, but unscathed. The cat was then put in a box and driven back to where it started. There is no word on whether or not it was a stray or welcomed back to hearth and home. Instagram + Cats = Nyanstagram!